In order to understand headshaking in horses, it is first necessary to understand the normal healthy horse. The horse has successfully evolved over millions of years, longer than human evolution. Horse headshaking, or head tossing, is a common condition, increasing in prevalence throughout the world. It seems very unlikely or impossible that headshaking could be caused by some unexplained recently developed neurological or eye defect. Instead let us look at the horse and examine what mechanisms the horse, with all its power and speed, has evolved to survive so successfully. The horse may be large, but it has a very small and lethal enemy, the fly. The horse's principal defence against flies is movement. A horse at the gallop is not likely to be bothered by flies, and does not headshake at the gallop. Moving less quickly, or at rest, the horse has a number of movement methods for keeping flies away. Tail swishing is obvious, as is flicking the ears. The body of the horse is covered with a layer of panniculus muscles just under the skin, and these muscles react to flick away flies whenever a fly disturbs the end of the coat hairs. This reaction has to be very fast, and so messages are conveyed locally through nerve junctions in the spine. The lower legs have no panniculus muscles. A fly detected in these four areas will be removed by foot stamping. Now we come to the interesting part. There are no panniculus muscles on the neck and head. When a fly disturbs the hairs of the neck or head, the fly is removed by headshaking. Again this has to be rapid, before the fly can strike, and so the message is passed very quickly via the nerve junctions of the spine. If this anti-fly headshaking is observed carefully, it will be seen that it is an automatic action over which the horse, that is the brain of the horse, has no control. All of these automatic actions have an energy cost for the horse, and so the horse has evolved to switch the whole fly defence system off when there are no flies around. How does the horse know that there are flies around? The answer is daylight and warmth. As the ambient temperature rises in the spring, the horse switches on the anti-fly reflex during the day, and off again at night. This can be tested on a warm day by lightly brushing the hairs of the flank of the horse with the finger tips. The horse will automatically flick the panniculus muscles, seen as a ripple on the skin. If the horse is now taken into a dark barn out of the light, the whole anti-fly relex will shut down in the absence of daylight. In a dark barn it is dangerous to imitate fly landing, or to have flies around. With the anti-fly reflex system shut down in the absence of daylight, the horse will defend itself against flies by making circular motions with the hind legs and rearing up at the front. This is why it is not a good idea to work around a horse in dark conditions. Note that even a small shaft of daylight into the barn will tell the horse that it is day, not night, and the normal anti-fly reflex may be switched on. So now we can see that headshaking to remove flies is automatic and will occur during the longer warmer days of the spring, summer and early fall, but will not occur at the gallop, in the dark, or in winter. We can also now understand why some headshaking can be reduced by the use of head and eye masks, stopping or limiting the natural anti-fly reflex. To demonstrate just how powerful and uncontrolled the anti-fly headshake is, the movie on this page shows a perfectly healthy eleven year old mare, who has never had a headshake, being induced to headshake in daylight on a warm day by lightly brushing the ends of the neck hairs. Particularly notice the ears. This is a dangerous procedure and there are plenty of people who have been injured by the sudden automatic headshake movement, but it does prove the direct connection between automatic headshaking and the neck hairs. We have seen that headshaking in the normal horse is a natural defensive reaction to the presence of flies. Headshaking horses repeatedly perform the movement even though there is no current threat from flies. This is an abnormal movement and often results in the horse being unable to be used. It is usually stated that there is no cure for headshaking. With our analysis of the aetiology (the underlying cause), that has all changed. We now know the cause with certainty, and correction of the condition is readily available. Our work on horse bleeding from the lungs (exercise induced pulmonary haemorrhage) has now saved many hundreds of horses from this previously incurable debilitating condition. Bleeding is very common and is due to additional high blood pressure in the horse. Horse blood pressure rises naturally for speed and acceleration, but any obstruction of circulation will further raise blood pressure until blood vessel damage occurs. Some of this blood vessel damage occurs in the skin, at the level where both nerves and blood vessels surround the hair bulb. It is these nerves which trigger headshaking, because the nerve messages from the hair bulb are those which trigger the head to shake, to throw off flies. A horse does not normally have high blood pressure at rest, although we have seen a few rare cases. Once the horse starts to exercise, if the obstructed circulation causes pressure on the hair bulbs of the neck or head, then the head will shake. This is why in most cases, horses only headshake when they are asked for work. The first action to be taken is to return the blood pressure to normal, whether exercising or not. High blood pressure (essential hypertension) is not routinely recognised in horses by the veterinary profession, and so there are no conventional drug treatments. The only product designed to encourage normal electrolyte balance in a horse is Equiwinner, which comes with a money back guarantee. Equiwinner is a simple ten day course of patches. Where the horse has been headshaking for some time, perhaps for years, as previously there was no treatment, headshaking may have been partly alleviated by suppression of the natural reflexes with restraining tack, or with masks, sedatives, herbs or other substances. In these long term cases more time is needed for repair of the damaged blood vessels and nerves around the hair bulbs of the head and neck. In these long term cases, a second course of Equiwinner may be needed. This is best combined with daily exercise and when the horse is warmed up, a twice daily hosing with cold water over the head and neck, and along the length of the spine.. If a cold hose is not available, buckets of water with ice may be used. The reason for the cold water is that by good fortune there is a small muscle attached to the hair bulb which pulls the hair upright in response to cold. By exercising this muscle we can help good circulation to the hair bulb and free up the nerves. Because of the fact that domesticated horses can never get enough continuous exercise, excess blood pressure may very slowly start to rise again over a period of time. It is therefore recommended to follow up by using Equiwinner again at least once yearly to keep the circulation in good condition and to avoid any further trouble. Please contact us or use our worldwide phone back service for further information. Equiwinner can be dispatched quickly to you from the order page. During the summer fly season, in daylight, the shaded areas automatically move in response to fly activation of coat hairs - by ear twitching, headshaking, tail swishing, and foot stamping. The unshaded area has panniculus muscles which are automatically activated to flick off any flies. All of the anti-fly reflex system shuts down during darkness and during winter. This is a healthy eleven year old mare who has never had the headshaking condition. There are no flies around, but two instances of headshaking are being induced by lightly touching the neck hairs to imitate a fly. This activates one of the horse's anti-fly defences - automatic headshaking. The movement is often described as the horse seeming to have a fly up her nose. The procedure in the movie is dangerous and may have unpredictably violent results, but the demonstration does prove the connection between automatic headshaking and the neck hairs. The horse is being induced to fight off what it detects as a lethal enemy - the fly. The automatic reaction is the headshake. 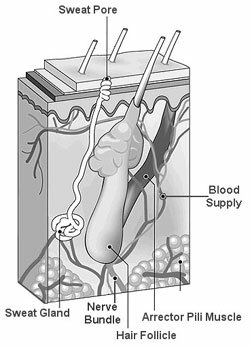 Diagram showing the nerve bundle attachments to a hair follicle deep in the skin of the horse. The arrector pili muscle contracts in response to cold, pulling the hair follicle to bring the hair upright. The whole area of the skin has millions of fragile blood capillaries with walls of only one cell thickness. These are easily damaged by leaking sweat trapped in the skin. The loss of blood capillaries (called rarefaction) reduces circulation capacity and raises blood pressure. The skin of the head and neck of the horse is much thinner than body skin. In the head and neck, the skin components - blood vessels, nerves and sweat glands, are more tightly packed and so excess pressure can cause much greater disruption. The information on this page details the cause and treatment of idiopathic headshaking, also known as classic headshaking or automatic headshaking. A horse may shake the head for many other reasons including dental problems, locomotor problems needing physiotherapy, tack problems, inflammation of the sinuses including allergy, protozoal and other infections, trauma to the head, brain conditions, internal growths and behavioural habit. Idiopathic headshaking can be recognised by the violence and consistency of the movement, and usually the absence of the headshaking during the winter and in the dark. An elimination test, which needs to be done under the supervision of a vet or other professional equine practitioner, is to exercise the horse with all light excluded from the eyes with opaque goggles or a mask, in an area where there are no flies. Idiopathic headshakers will not headshake in the absence of light.